Boston's vibrant theater scene includes more than a dozen major performance venues in the Downtown Theatre District, plus even more in other nearby Boston neighborhoods and Cambridge. Choose top performances ranging from popular Broadway musicals to avant-garde experimental productions - plus opera, dance, comedy shows, and everything in between. 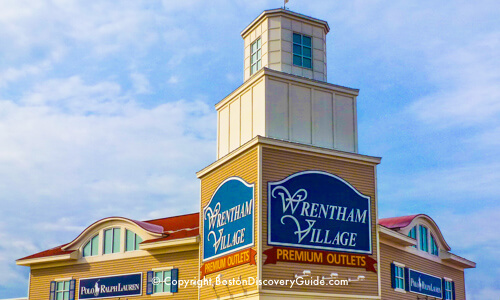 Although the main theater season runs from September through June, popular shows such as Blue Man Group, Shear Madness, and Broadway hits attract big crowds year-round. In July and August, Shakespeare on the Common stages a masterpiece by the Bard in a free "theater under the stars." Use our Boston Theater Guide to find schedules and tickets (including discounts and half price tickets for some shows) for each venue. The splendidly baroque Boston Opera House (539 Washington Street) provides a spectacular setting for Broadway musicals, famous performers, and lavish productions. Dazzling with gold, crystal, and a painted dome ceiling, the ornate theater surrounds you with luxury and opulence. This is where you can see Boston Ballet perform their famous production of The Nutcracker every year during November and December. 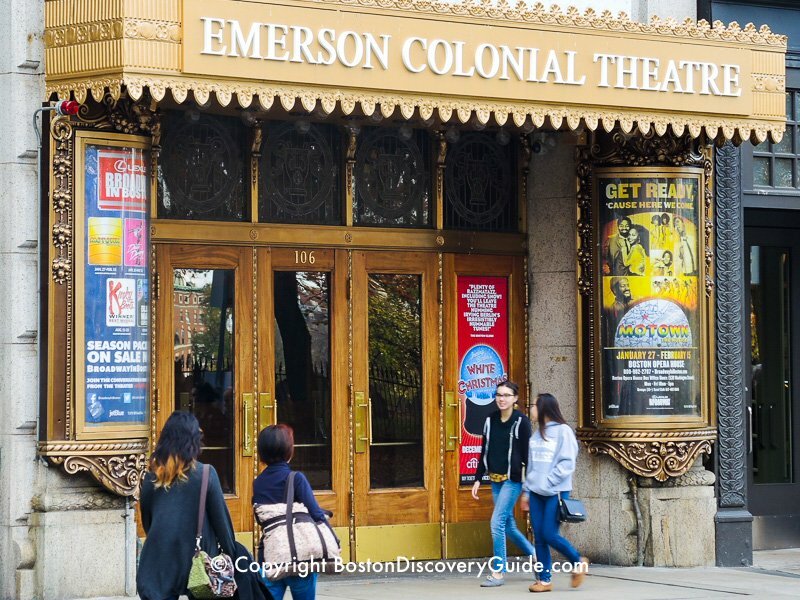 The ornate 1,700 seat Colonial Theatre (106 Boylston Street), owned by Emerson College, dates back to 1990 and holds the title as the oldest continually operating theatre in America (except for renovation closures). The theater sparkles after multimillion dollar restorations with tons (literally) of crystal chandeliers, mirrors, hand-painted murals in the lobby, fabulous mosaic floors, and lots and lots of gold leaf. But Colonial Theatre's fame comes from premiering pre-Broadway hits before they move to New York: The Diary of Anne Frank, Porgy and Bess, Oklahoma!, and Annie Get Your Gun all opened here. With London-based Ambassador Theatre Group of programming, the theater premiers Broadway-bound musicals and plays (at pre-NYC ticket prices!) and also hosts local performing groups. Wang Theater (270 Tremont Street) seats about 3,700 people, making it the largest performance space in the Theatre District. 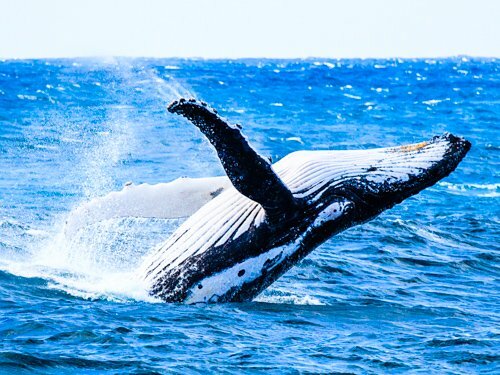 This is where you'll see the huge extravaganzas by touring theater, ballet, and opera companies, as well as one-person shows by famous performers. Designed to emulate the Paris Opera House and Versailles, the theater has been extensively - and expensively - restored. As you walk into the Grand Lobby, your eyes will immediately be drawn to the massive rose jasper pillars, lavish marble doorways, and the opulent painted ceiling punctuated with gold-plated chandeliers weighing almost a ton apiece. The 1,500-seat Shubert Theatre (265 Tremont Street) dates back to 1910 - the glory days of Boston theater, when it was just one of seven Theatre District venues owned by the New York-based Shubert brothers. Multiple renovations have ensured that the cream-and-gold Shubert retains its original gleam and sparkle. The ornate lobby and marble entrance area look unchanged. When you attend a performance here, the Shubert's elegant, intimate interior will give you a glimpse of what gala evenings must have felt like here a century ago. 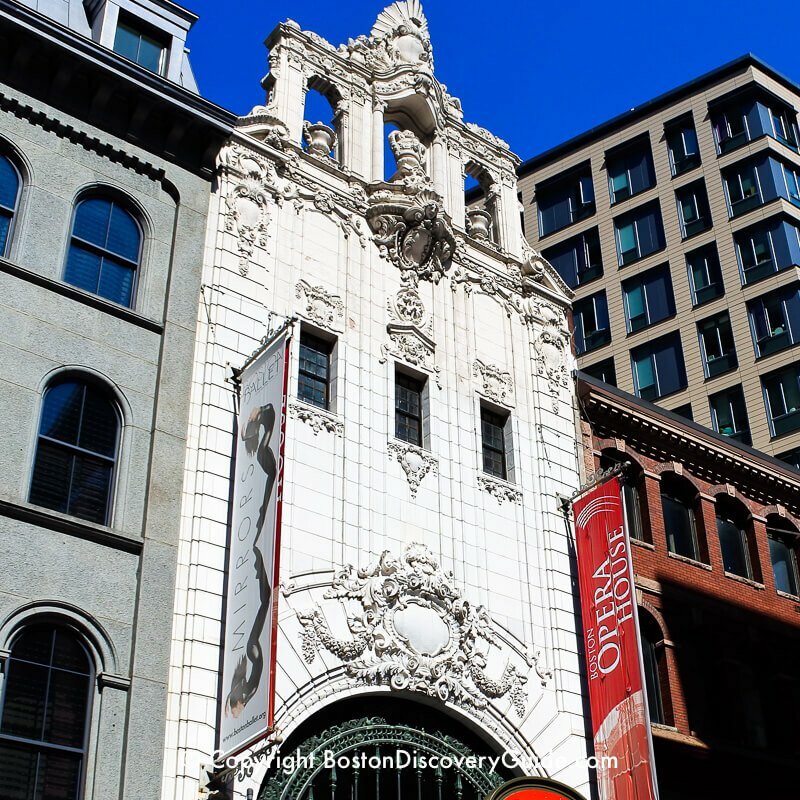 Built in 1903 as a venue for opera performances, the ornate gray terracotta Cutler Majestic Theatre (219 Tremont Street) features fluted columns and high arched windows topped with masked faces. Because the Cutler Majestic was originally designed for opera, it's design eliminates support pillars, so sight lines from all seats are excellent. You'll also appreciate the wonderful acoustics made possible by the lack of pillars. 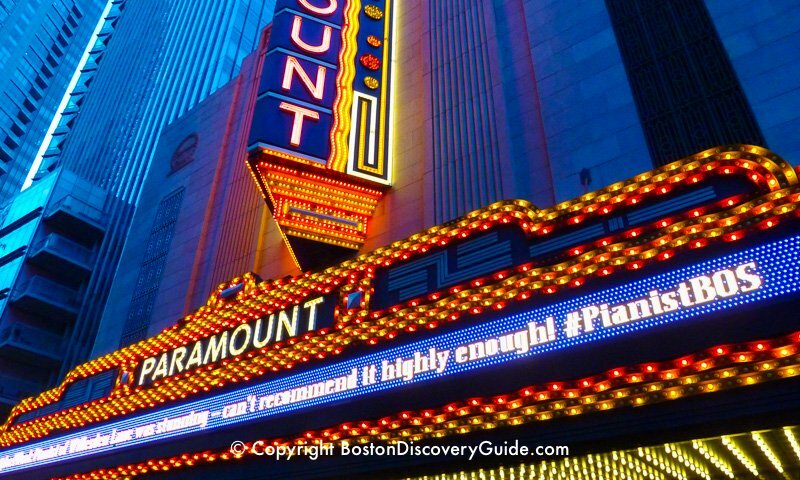 The Paramount Theatre (559 Washington Street), owned by Emerson College, presents an eclectic line up of theater, film, dance performances in its 596-seat theater, "black box" space seating up to 150, and 170-seat film screening room. If you're interested in experimental, contemporary, and avant-garde works, the Paramount is always a good place to start. The historic Wilbur Theatre (246 Tremont Street) showcases top comedy and music acts almost every night of the year, although the theater once hosted pre-Broadway and off-Broadway touring productions. Built in 1914, the Wilbur's Federal Revival style echoes Beacon Hill and stands apart from the ultra-ornate styles of other Theatre District venues. Despite the Orpheum Theatre's name, you won't usually see theatrical performances at here . . . unless you consider rock concerts to be a form of theater. However, you can hear world-class musicians in this rather special concert venue, site of so many epic Boston rock concerts during the past few decades. Built in 1852, the Orpheum (1 Hamilton Place) is one of the oldest theaters in the U.S. Originally called Boston Music Hall, the Orpheum served as home to Boston Symphony Orchestra until 1900, when it was converted to a vaudeville theater and given its present name. The Orpheum looks small on the outside and you reach it by walking down a short alley, but inside, it's huge, with 2,800 seats and legendary acoustics. You will swear the seats haven't been updated since 1852 and with no air conditioning, the Orpheum can feel like a sauna. But there's still nothing else quite like it, which is why Bruce Springsteen, The Police, Kiss, the Grateful Dead, U2, Lenny Kravitz, and the Allman Brothers are just a few of the performers who have put on iconic performances here. The stately Greek Revival-style Charles Playhouse (74 Warrenton Street) just two shows: Blue Man Group and Shear Madness. Both shows have played here for 30+ years, and still sell out due to hoards of enthusiastic fans. What's the secret to their non-ending popularity? Constant change, innovation, and plenty of laughs. You can see the shows multiple times without getting bored. 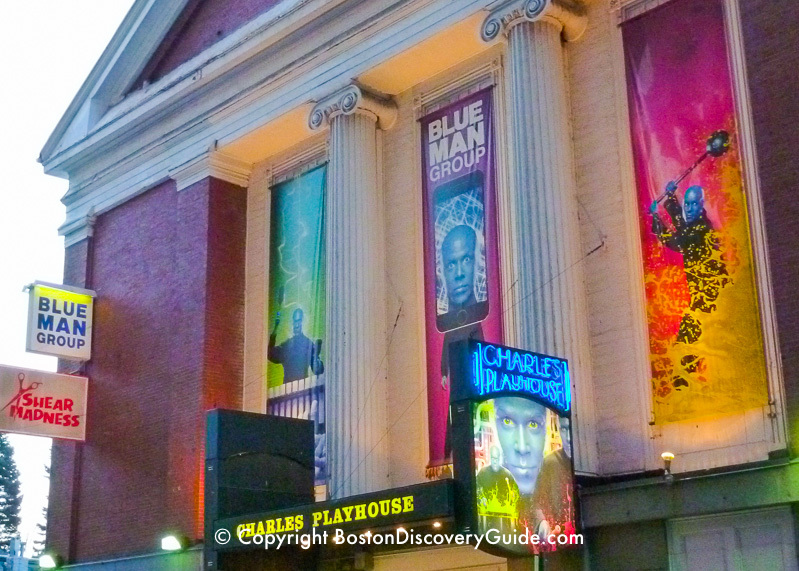 Plenty of nearby restaurants and several of Boston's top clubs place the Charles Playhouse in a lively part of the Theatre District. Shear Madness Tickets: Check their website: http://shearmadness.com; also, check Goldstar for occasional discount tickets. The Modern Theatre (523 Washington Street) owes its beginning to an architect who carved it out of a furniture store/warehouse built in 1876, added the elegant 2-story white marble Florentine Renaissance front facade you see today, and gave it its name. Inside, the theater did not have a stage but instead boasted excellent acoustics optimized by a Harvard professor. After The Jazz Singer, the first talking film, premiered here in the late 1920s, the Modern turned into a "talkie" cinema but by the 1950s, it started a long decline as an adults-only venue at the edge of what was then Boston's "Combat Zone" - the kind of place where moms had to cover their children's eyes as they walked past the posters. 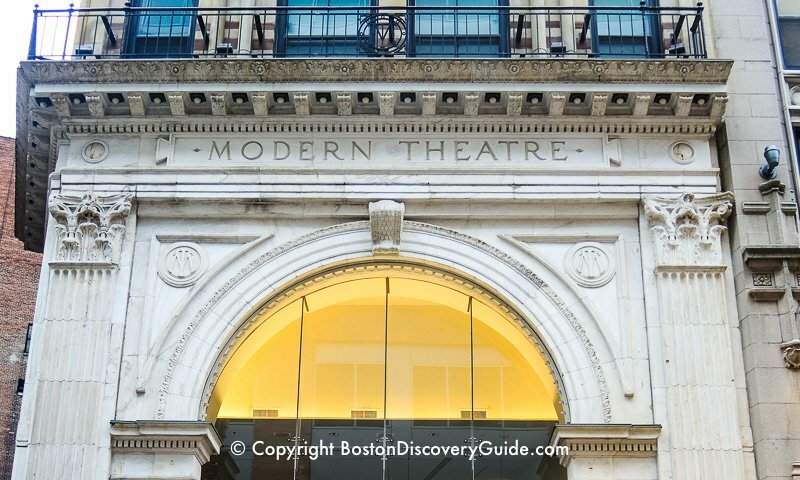 By the time Suffolk University bought the dilapidated theater in 2007 to create student dorms, the space was considered beyond repair - but in one of the city's most challenging projects, Suffolk restored the Modern's classic facade while erecting an unobstrusive 12-floor dorm tower behind it. Today, a 185-seat theater along with a lobby, balcony, and gallery occupies the first two levels of the building, with a grand curving staircase and hand-painted theatrical scenes on the walls. You'll find an eclectic mix of theater and dance performances, poetry readings, lectures, and other programming here. Discount and half-price tickets are occasionally available to some shows at Goldstar. Lyric Stage Company (140 Clarendon Street, 2nd floor), founded in 1974, is Boston's oldest theater company. They produce seven shows reflecting a wide range genres and styles each season, with an emphasis on plays that are entertaining, challenging, and provocative. Lyric Stage Company occupies a mid-sized theater has a convenient location in the recently renovated YWCA building next to Copley Square. You'll almost always see works by contemporary or modern playwrights, and an emphasis on established and emerging local talent. 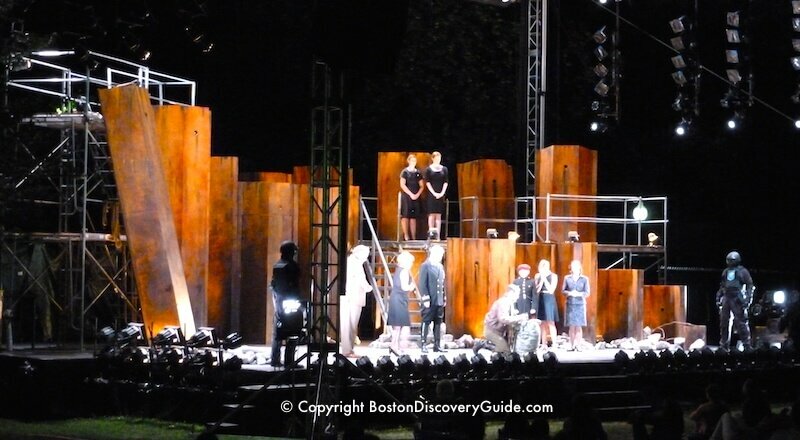 Commonwealth Shakespeare Company erects a temporary stage on Boston Common for about 3 weeks each summer spanning late July - early August and gives free performances of one of Shakespeare's plays under the stars. This beloved Boston tradition attracts 100,000+ people each year, and is the perfect way to spend a summer evening. Even though Shakespeare wrote his plays more than 400 years ago, CommShakes gives them a contemporary twist in performances that are always entertaining, provocative, and compelling. Now part of Berklee College of Music, Boston Conservatory (31 Hemenway St, Fenway neighborhood; Green Line E/Symphony) typically presents shows featuring music, dance/movement, acting, and sometimes emerging technologies and mixed media art. Some number of the professional-level performers go on to become nationally and internationally renowned - so it's always worth checking to see what's on here. Located in Boston's Fenway district, Wheelock Family Theatre (200 Riverway; Green Line C/St Mary's Street) features a comfortable tiered auditorium seating 650 and puts on several family-oriented productions each year. The American Repertory Theatre (A.R.T.) focuses on serious and sometimes edgy or experimental drama. This is where you'll see plays by playwrights such as Samuel Beckett, David Mamet, Anton Chekhov, and Shakespeare. A.R.T. has two main venues, both in the Harvard Square area of Cambridge: Loeb Drama Center (64 Brattle Street; Red Line/Harvard) and OBERON (2 Arrow Street; Red Line/Harvard). OBERON provides an incubator for emerging artists and innovative performance projects. Tickets: Check A.R.T. 's website http://americanrepertorytheater.org; particularly for OBERON, check Goldstar for frequently-available discount or half-price tickets. Boston Center for the Arts (539 Tremont Street, South End; Orange Line/Mass Ave) is actually a sprawling complex in Boston's South End neighborhood where you'll find four small to mid-sized theaters in the Calderwood Pavilion, as well as two more even smaller spaces known as the BCA Plaza Theaters. BCA is home to several resident Boston theater groups and a number of other performing artists. 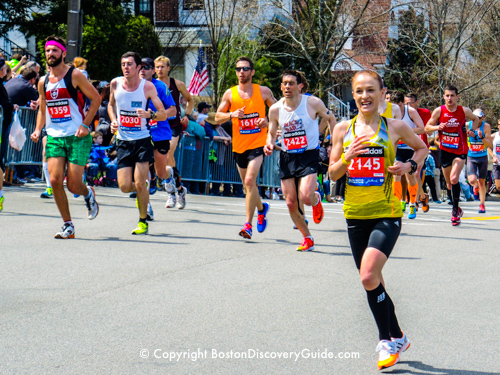 Calderwood Pavilion is also the site of the Boston Theatre Marathon held each May. If you want to attend a play while you're in Boston and are flexible about what you see, you'll almost always find something interesting here that you might not have a chance to see anywhere else. Look for social themes, experimental staging, and avant-garde sensibilities. Tickets: www.bcaonline.org; also check Goldstar as discount or half-price tickets are almost always available for at least some shows. The 890-seat Boston University Theatre (264 Huntington Ave, Fenway neighborhood; Green Line E/Symphony) is home to Huntington Theatre Company, the largest resident Boston theater group, which also performs in the Calderwood Pavilion at BCA. Due a change in ownership, the BU Theater is expected to close for renovations after the current theater season; Huntington Theatre Company will move their larger productions to a different space (still to be determined) for the duration, and then return once renovations are complete. At some point, the theater may be renamed. So stay tuned as more details emerge. Tickets for Huntington Theatre Company's BU Theatre and Calderwood Pavilion productions: www.huntingtontheatre.org; also check Goldstar for discount or half-price tickets at both venues. Although the following venues primarily host sports events or concerts, they do sometimes present other types of performances such as Disney on Ice, dance, multimedia, or one-person shows by famous performers.